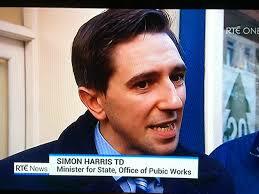 It seems that Minister Simon Harris was issued with a new portfolio without anyone knowing about it. Minister Harris was interviewed yesterday evening on the Six One News about the recent flooding, but the caption under his name didn’t quite match with his current position as Minister for State, Office of Public Works. RTE’s unfortunate typo had viewers wondering what the new title meant exactly and the world of twitter was sent into a state of hysteria. It gave us here at wicklownews.net a good giggle as well.